The coming of October heralds the return of free parking at Port Eynon, which may or may not have explained my sudden urge to visit there on the first of the month. That particular soiree ended in a very wet dash back to the car following a downpour that felt more like standing under a waterfall than in an autumn shower. I was steaming, literally and metaphorically, once I'd reached home at the loss of what had looked like a promising birding day. White Wagtails and a couple of Wheatears had been just a taster before rain, as they say, had definitely stopped play. Fast forward to Saturday and it was round two between me and Port Eynon. 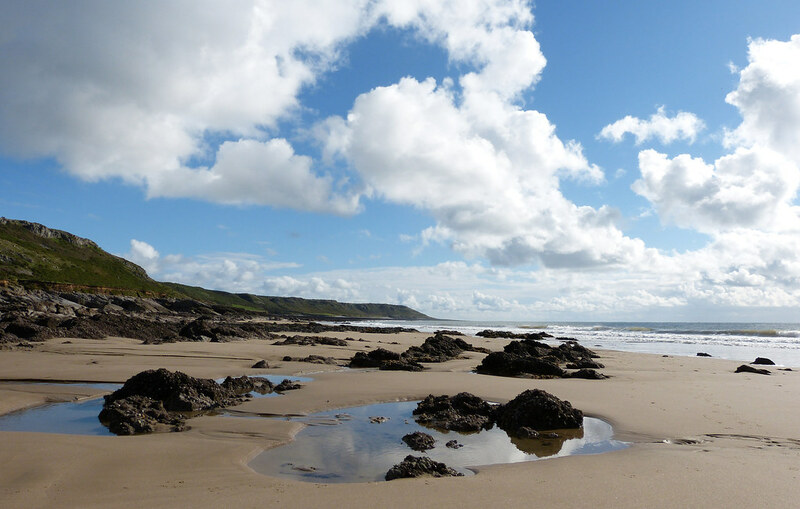 Thankfully this time I had the weather on my side and set off along the beach towards Oxwich. Six Ringed Plovers and a calling Dunlin were doing their best to find a quiet stretch of sand near the lifeguard hut, whilst a Shore Crab was definitely regretting its discovery by one of the marauding Herring Gulls. 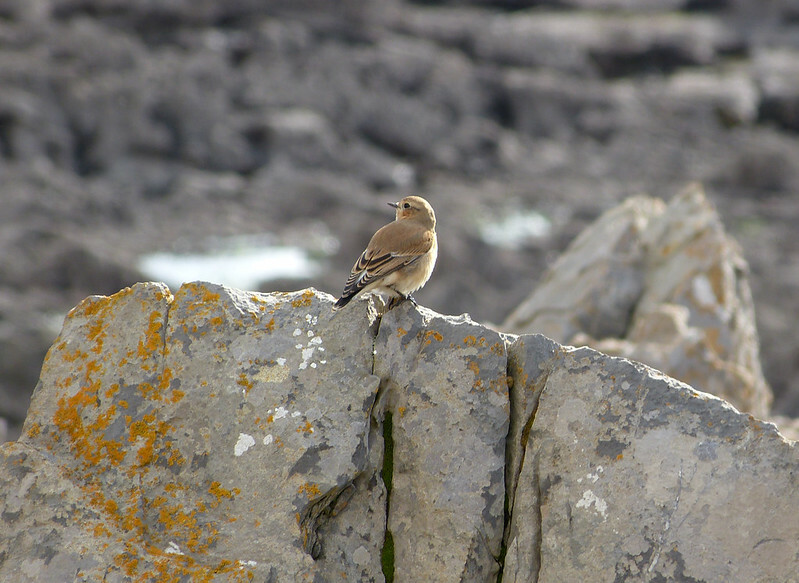 All kept their distance until we spotted this Wheatear on the rocks. As with other migrants at this time of year I'm constantly aware that each one I see could very well be my last until next spring. This applies even more so to our aerial visitors which made the presence of several small flocks of Swallows and a single movement of 26 House Martins that much more gratifying. It was a particularly nice surprise to see the latter as I don't think I'd seen any up to that point for at least a month. At ground level the sound of Robins defending their territory served as an ever present audio backdrop, but the hoped for first Redwing of the autumn failed to materialise. 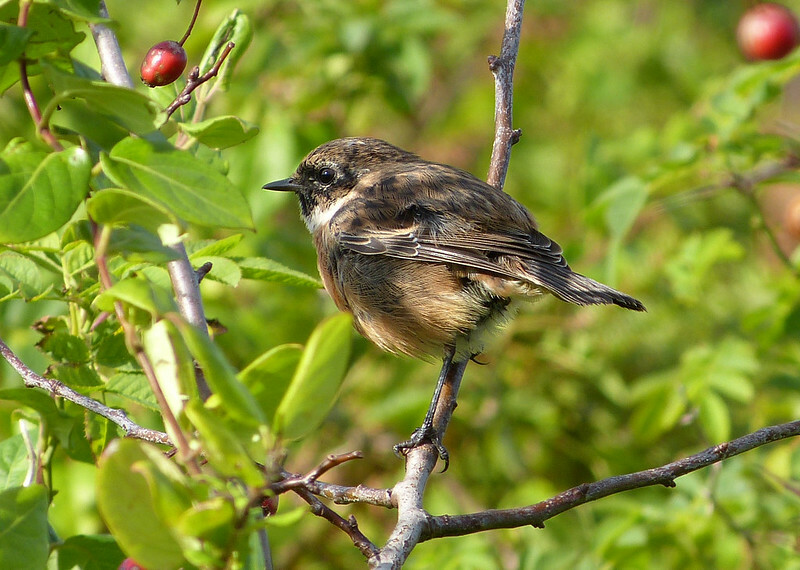 There were certain compensations though including this male Stonechat at Horton. For a species that I used to struggle to photograph it seems I can do no wrong at present. 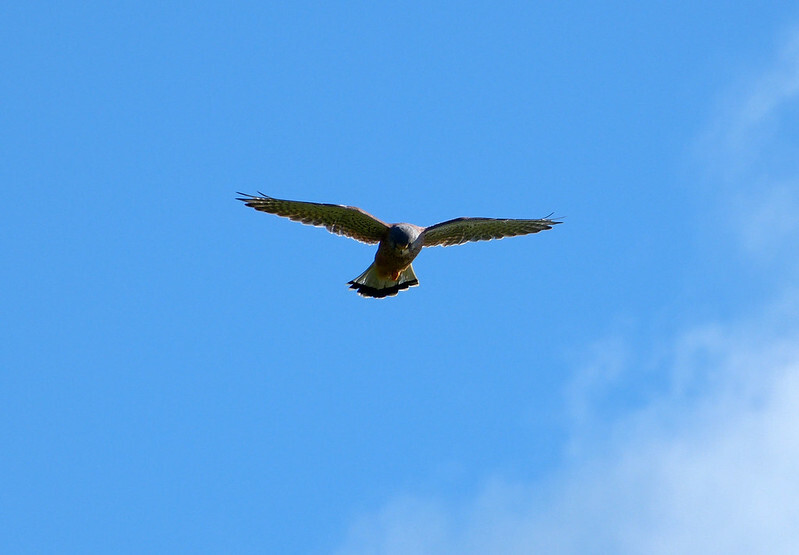 The days star birds were to be found midway towards Oxwich Point and came in the shape of a pair of Kestrels. 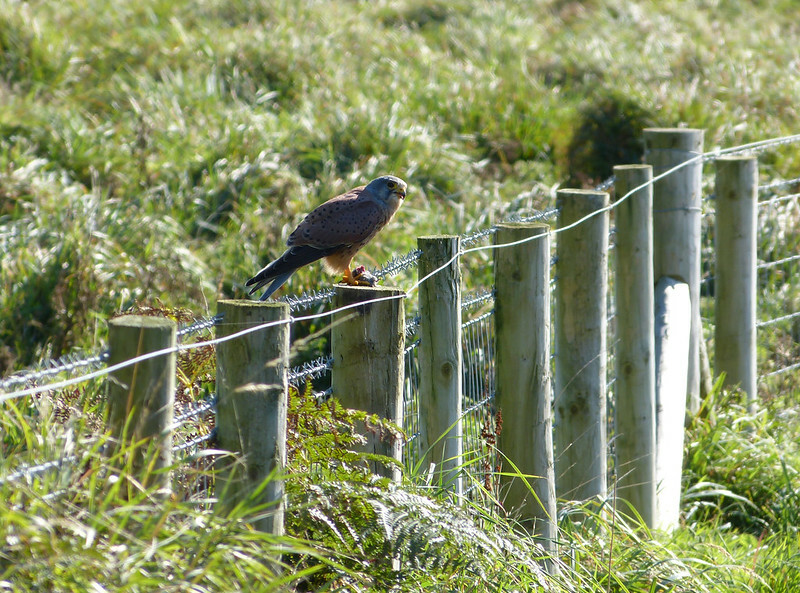 They were both hunting along the footpath and afforded us superb views both in flight and as they perched in an adjoining field. 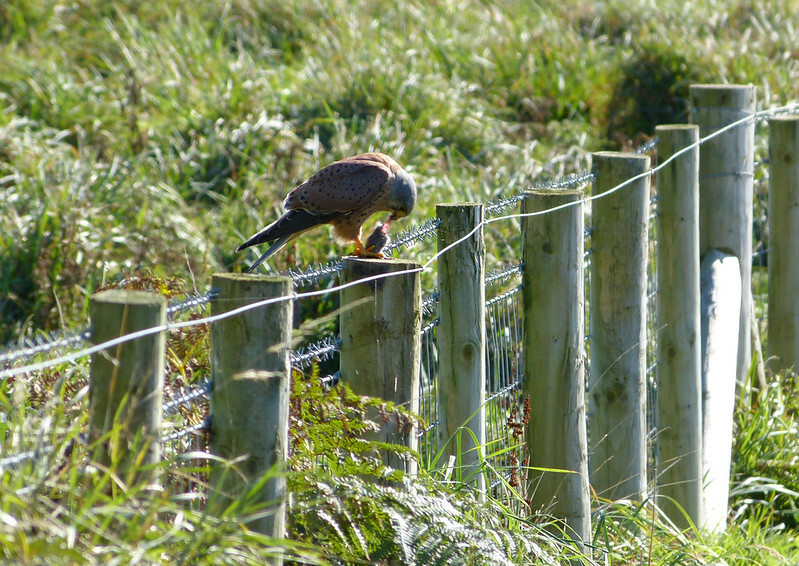 Better was to come though when one of the birds made a successful kill and started to devour its prey on a nearby fence post. With that position clearly not to its liking it instead took to the air and continued its meal on the wing. I've seen this behaviour before but never at such close quarters and it was spectacular to say the least. By the time we finally reached the Point we'd added a couple of Curlew, a Grey Heron and six Oystercatchers to our list, along with a surprisingly large number of Wood Pigeons. Whether or not it was the same flock we kept seeing I can't be sure, but there were certainly more than I have ever seen there before. 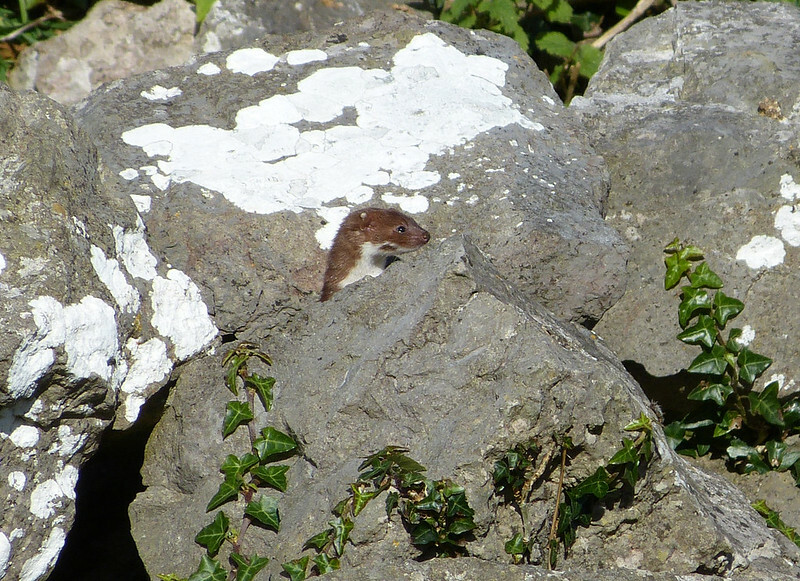 A surprise was waiting in store for us at the top of the cliffs where a tumbledown wall and a chance stop found us face to face with a Weasel! It darted back between the stones before popping its head above the parapets again moments later. This went on for a good few minutes before it finally ran into a hole not to return, no doubt encouraged into hiding by the calls of a Buzzard drifting ever nearer. 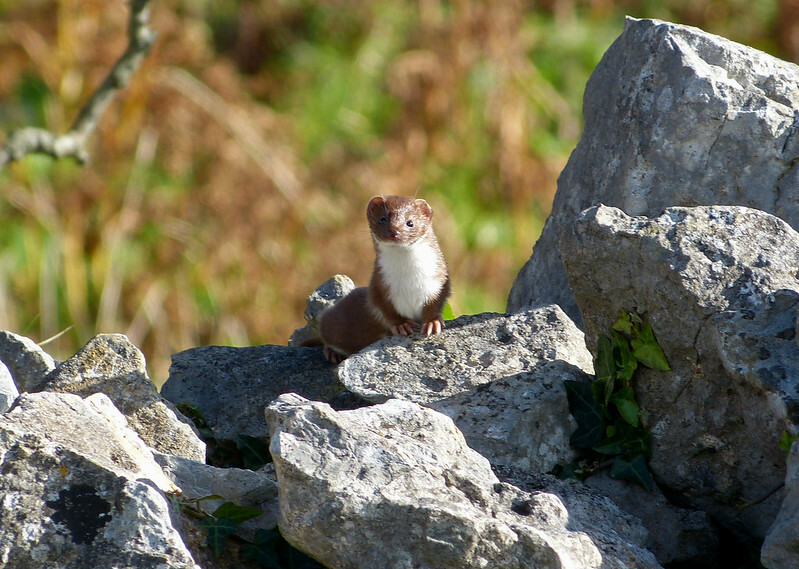 I last saw a Weasel on Gower well over two years ago and on that occasion didn't have my camera to hand. Thankfully this time I was a lot better prepared. Our return route took us inland towards Oxwich castle where a Chiffchaff and probable (although very late) Garden Warbler were skulking through the trees. A Mistle Thrush could be heard calling from the other side of a hedgerow but remained out of sight. From that point on it was more of the same with a fly over Great Spotted Woodpecker rounding the day off nicely. the kestrel is so beautiful. that weasel is too cute, though! Swallows and Martins; two birds I've not seen for some time Adam. Great set of shots, especially the Weasel. Beautiful scenes and birds, especially liked the tremendous shots of the kestrel and the weasel. An awesome serie of photos! TexWisGirl - I'm really please with the Weasel. Had never seen one before. Keith - thanks. I reckon those will be the last House Martins I see now. Gillian - thanks. Glad you enjoyed. A great post. 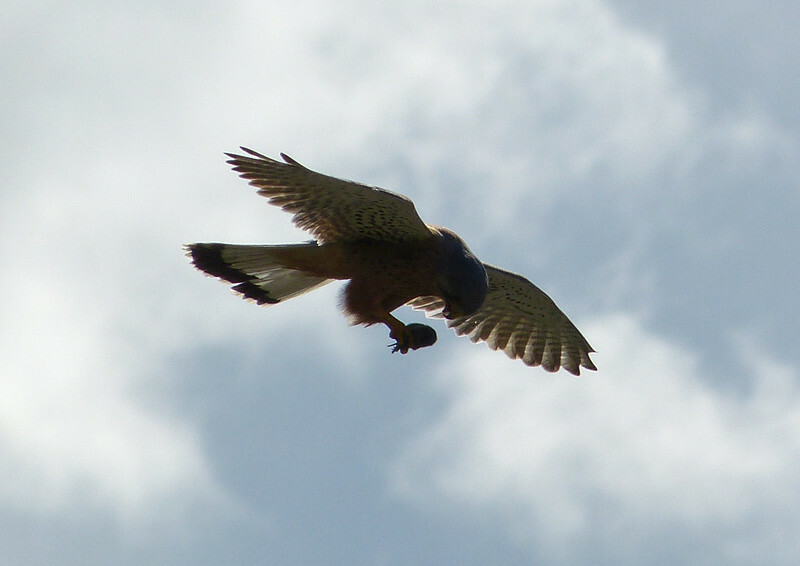 Kestrels are superb. The Weasel is amazing ... I have rarely seen these, though we have seen Stoats in Yorkshire. Beautiful series love the weasel. That weasel is a great shot! We dont have any members of that family in Australia - last ones I saw were in The Lakes last century!